Every four years, fans around the world cheered, cried and roared as their home countries, or ones that they support compete in the World Cup. And the end of the season, with the finals, fans also celebrates the victory of the winner, get-together and be merry. 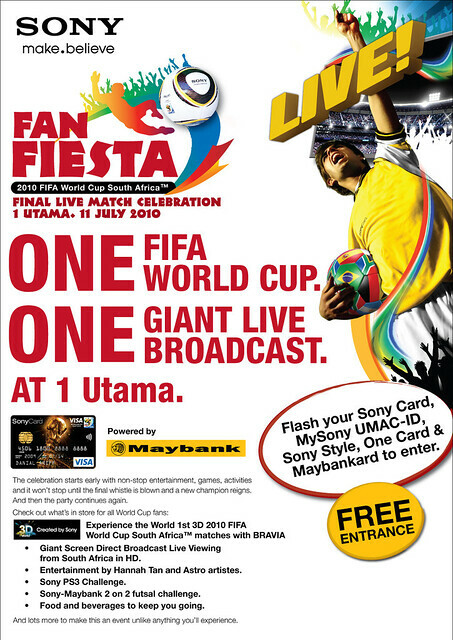 So this time around, Sony Malaysia together with Maybank as the SonyCard co-brand partner would like to cordially invite bloggers to celebrate the glory of FIFA World Cup 2010 finals at the Sony Fan Fiesta, happening from 11th July 2010 at 1 Utama Shopping Centre, Central Park Avenue from 8 p.m. til late. Sony & Advertlets would like to invite bloggers to this event, please RSVP your attendance with Jason Ong at Jason.ong@advertlets.com with the title ‘Sony Fan Fiesta RSVP’.